We’ve been so excited to share the new Trip Plans app with all Travefy Professional Plus and Premium users! We’ve heard amazing feedback on how it has helped connect clients with their itineraries quicker and seamlessly. Since it has launched, we added another game-changing layer to make it even better; the ability to communicate with your client. Here’s everything you need to know about the Trip Plans app, the newly integrated communication feature, and how to get it in your client’s hands today! How does the Trip Plans app work? The Trip Plans app is a completely unbranded app that your clients can download and view their itineraries on an iOS or Android device. What makes the Trip Plans app so unique is that clients can quickly view their itinerary offline or on the go. 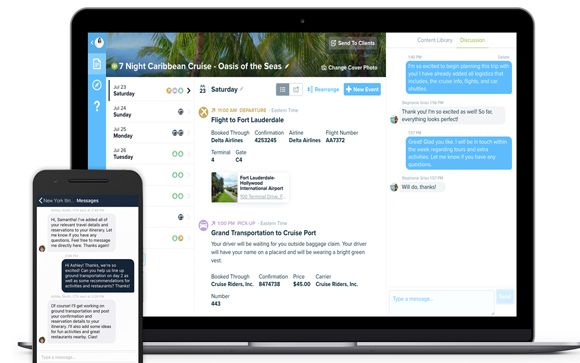 And now, Trip Plans users can send messages back and forth with their advisor discussing plans and asking questions–an easy and simple experience for both the advisor and client. For more information, check out this article. What does the new messaging feature look like? Once a client has downloaded the Trip Plans app for their device and opened the itinerary, they will see a conversation bubble at the top and can tap on it to chat with the travel advisor. When a client sends a message in the app, the travel advisor will be notified by email and can go into their Travefy Professional account and communicate right on the itinerary page. Does anything change for my clients who’s already using the app? For those who have already shared itineraries with clients via the Trip Plans app, you will need to “turn on” the messaging because you have the option to enable or disable messaging. To manage the preference, follow these simple steps. How can I get the Trip Plans app for my clients? The Trip Plans app is available for all Travefy Professional Plus and Premium users. If you don’t have a Travefy Professional account, you can sign up for a free 10-day trial and try it out yourself. If you would like to upgrade your current Travefy Professional account to gain access to the Trip Plans app, email us today at professional@travefy.com.